Along with UAG#1 this mysterious prototype was found in a salvage yard in 1998 by Ben Liashenko. For many years we did not know the name of this game since the label that once existed had long since fallen off. However in 2017 another copy of this game appeared on Ebay UK complete with a label. We now know that the game is called Hard Head. Hard Head plays somewhat like Atari's Save Mary. However this time instead of building a tower by dropping bricks from the top of the screen, you must bump blocks from the bottom of the screen. Before you start screaming about Activision copying Atari's idea, keep in mind that this game was programmed about seven years before Save Mary. I'm sure the similarity of the concepts is just a coincidence. In Hard Head you control a little Space Invader guy who must use the blocks at the bottom of the screen to build a tower and escape. As the blocks come rolling down the conveyor belt, you must jump up and bump them so they land somewhere on the screen (the blocks don't count if they go off the edge of the screen). The movement scheme in this prototype is a bit unusual as the longer you hold the joystick in a direction, the faster your little guy will run. 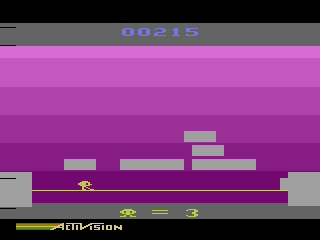 Although this is very realistic, it is a bit odd for a 2600 game and may take some time to get used to. Once you have constructed a nice little tower, you must carefully jump on the conveyor belt and them climb the tower. Be extra careful on the conveyor belt, as touching the blocks will cause your little guy to be flattened. Starting on the second level, you'll undoubtedly notice that some blocks will flash yellow or blue. These colored blocks are actually part of an elaborate timing/bonus system. The yellow block (which I call the Bump block) moves up the tower at the rate of once block a second, while the blue block (which I call the Bonus block) moves up the tower one block every time the yellow block reaches the top of the screen. If your character happen to be on the tower when the yellow block touches him, you will be knocked down one level (slowing your decent up the tower). However if your character touches the blue 'Bonus' block, you will gain bonus points as long as he remains on the block. However greed can be a dangerous thing as the tower will collapse after a certain amount of time (determined by the difficulty level). When the warning alarm sounds, you have exactly 10 seconds to hightail it up the tower or you'll be crushed under the debris. 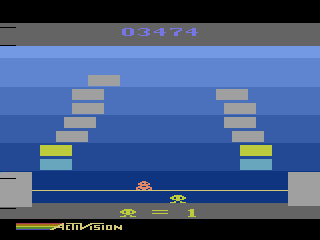 Starting on the third level, strange aliens creatures will begin to fly around the screen. You can destroy them by hitting them with a flying block. 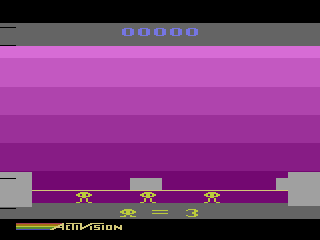 Smashing aliens is worth 180 points, while simply bumping a block will net you 5 points. If you let the octopus alien reach the bottom of the screen he'll start breeding and clog the area. However since you can simply knock the extra aliens out of the way so he's not a really big problem. If you're really tricky you can use the blocks to fence in the alien and keep him form reaching the bottom, but this is more trouble than it's worth. 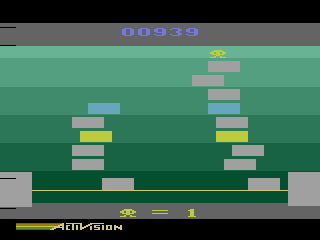 Starting on the fourth level a squat looking alien with two legs will rapidly move down the screen and try to catch your guy at the bottom of the screen. When this happens you'll need to jump on the conveyer belt temporarily to escape until he disappears. Unfortunately this alien is immune to the blocks so all you can do is avoid him. If you manage to score 100,000 points the score counter will reset to zero and you will be rewarded with an extra life. 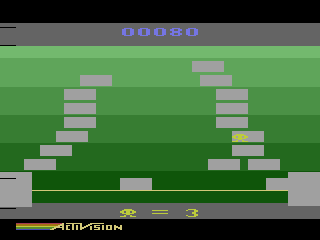 Unlike most Activision games, Hard Head has no game variations. However since this is still a WIP, game variations may have been planned later on. The left difficulty switch controls the game difficulty (A=Easy, B=Hard), while the right switch appears to control how your character climbs the blocks. When the right difficulty switch is in the 'B' position you cannot touch the center of the tower, as doing so will result in a block smashing your character. Instead you must build the tower in a staircase-like fashion and climb up the edges of the blocks. Naturally this is much more difficult to set up than a simple tower of blocks, so this variation is recommended for experts only. When the right switch is in the 'A' position, your character can climb up the center of the blocks making things much easier. Although this prototype appears to be nearly complete, there are still a few bugs in the game. 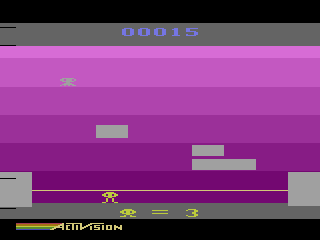 Glitches include such things as your character getting stuck in the walls, and the screen becoming unstable when being bumped by the yellow block or when avoiding the leg alien. The graphics and sounds for this title are top notch; it's obvious that a lot of work went into this game. Everything from the smooth animation of your character to the cute "Can-Can" sequence at the start of the game screams quality. So why was this game never released? 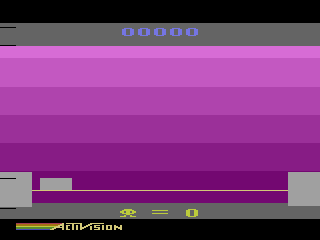 Unfortunately no one but the programmer knows the answer to this, but one possibility is that they may have left Activision before the game was completed. However since the real name of this game has now been discovered, we may yet be able to find the programmer and discover the history behind this interesting game. Special thanks to Mitch and bjk7382 for figuring out how to play the game in the 'A' position.